Girls on Film: 25 years Later. Girls on Film. We saw Duran Duran on Wednesday night. I give the experience a big fat, "Meh!" We saw them back in 2004. It was the first show in the US on their reunion tour, and it was the first concert ever at Agganis Arena. The place was pulsating with energy and excitement. Simon was gracious and genuinely thrilled to be there. He was vibrating with disbelief that he was 45 years old and still got to be a rockstar. He put on a show for all he was worth, flying about the stage and singing every hit I loved from the '80's. The did a couple songs off of their new album. But they knew what we were there for. They opened with Union of the Snake and sang every favorite song they had and the audience was screaming all the lyrics along with them. The Arena was packed. Simon told amusing anecdotes about what they'd been doing for the last 10 years. And he just seemed so grateful for the life he was leading. They showed this wonderful Anime to Careless Memories where Duran Duran fought Godzilla. Four years later the Ego returned. They opened with FIVE songs off their new techno album. Boring, Sidney. Boring. The arena was half empty. It's an awkward space for a proscenium stage. It's long and skinny and if you sit on the side, you have to keep your neck turned to see the stage. And they're too far away to see any details. Plus there was no screen. 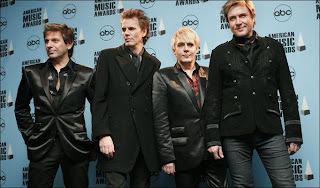 I suppose the guys are almost 50 and John Taylor has morphed from pretty boy to Keith Richards over the last 20 years, so I guess they decided to forgo the screen. But it was annoying watching these pupped sized performers bopping around without the giant screens to see them close up. And the LeBon ego was back with a vengeance. All his gracious banter was gone. He could care less that we shelled out more than $50 a ticket to hear The Chauffer (which they didn't play). I can't blame them for wanting to break out of their old body of work. Who would want to only play songs from 25 years ago? But at this stage of the game, that's what all the 30 and 40 year old women in the audience were after. And the audience was pretty much composed of 30 and 40 year old women. Here they are in their current Andy-Taylor-Less incarnation. JT is looking rather old and ghoulish. So, we went out to Western, MA this weekend and went screeching out the door to catch a nice dinner in Shelburne Falls and then we headed into Greenfield to catch the new Indiana Jones movie. The movie was beyond silly. Even within the context of the George Lucas, Spieldberg, Indiana Jones world. The plot could have been made up by a 10 year old on a rainy afternoon. But in spite of all that, I still enjoyed it for the most part. I was worried they'd pair Harrison Ford up with a 25 year old chicky. (shudder. The guy is my DAD's age for chrissakes. It just gets creepy after a while.) But they didn't. I won't spoil it, but his love interest in this one was at least age appropriate and totally hot. But the thing that I don't think I'll ever get is the sudden rise of Shia Lebouf?? Who is this kid and why does he keep getting cast in movies? He is not particularly attractive, nor is his acting terribly riveting or interesting. He is kind of this little nebish, more akin to George Castanza than Leonardo DiCaprio. I'm guessing he must be the child of some Hollywood producer, because what else could explain this? He hosted SNL and I had never heard of him. And he was mediocre. He was wooden in his role as a troubled greaser in IJAKCS. He was in three previews among the 20 or so they showed before the movie. It's a mystery to me for sure.